This week’s announcement that Pope Francis has extended an olive branch to gay priests and the LGBT community in general should be seen as a major development in the Roman Catholic Church—although how much change it will actually lead to remains very much in doubt. 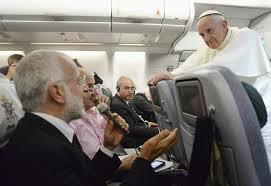 Pope Francis’s press conference aboard plane. For the cynical, such a comment inspires thoughts like: Congratulations, Your Holiness…Welcome to the 1970s! For gay and lesbian Catholics who still have their faith but are struggling for acceptance within the institution, the good news is tempered by the knowledge that the Church still considers homosexual acts to be “objectively” or “intrinsically” “disordered.” And so, by promoting a more merciful, hate-the-sin-but-love-the-sinner approach to homosexuality than his predecessor, Pope Francis’s comment could be regarded as simply throwing out a few bread crumbs; perpetuating a paternalistic, condescending model of compassion that doesn’t really advance understanding of human sexuality beyond, well, the Kinsey Reports of 1948 and 1953. But let’s look at it another way. This is the Roman Catholic Church we’re talking about. A place where nothing ever changes. At the very least, what the pope was saying, in effect, was: “In the effort to weed out corruption in the Vatican, please be assured that we will not be conducting a witch hunt against gay priests.” That’s a significant departure from Benedict XVI, who in 2005 who signed a Vatican document saying that men who had deep-rooted homosexual tendencies should not be priests. That document enabled two of Benedict’s most trusted Vatican deputies, Secretary of State Tarcisio Bertone and Dean of the College of Cardinals Angelo Sodano, to repeatedly spew their homophobic hatred and demonize gay clerics who did not play the Vatican closet game. What else did Francis say on the flight back from Brazil? In his chat with reporters, he was casual enough to make fun of his earlier quote that a “gay lobby” exists in the Vatican. All joshing aside, this comment suggests another, more strategic reason for Francis to say what he did. A few days before his trip to Brazil, it was alleged that the man he has appointed to be prelate of the Vatican Bank, Monsignor Battista Ricca, has a scandalous gay past—including reports that he moved his lover into the nunciature in Montevido, Uruguay and got him a job there, that he was found stuck in an elevator with a young man “known to police,” that he suffered a terrible beating after visiting a notorious cruising area, et cetera. Pope Francis, who dines frequently with the 57-year-old Ricca, authorized Vatican spokesman Federico Lombardi to dismiss the allegations and question the motives behind them. But regardless of their veracity, the rumours swirling around Ricca are a reminder that the pope is surrounded by gay priests wherever he cares to look. Now that the issues of homosexuality, clerics leading double lives, blackmail, and even sexual trysts on Vatican property are out in the open, Francis is in an awkward position. On one hand, he must continue to observe church teaching. On the other, he must not alienate gay clerics just for who they are, possibly risking a mass exodus from the priesthood and thus emptying the Vatican of some real talent. So he must tread carefully. By saying “who am I to judge?”, Francis is simply recognizing the reality that surrounds him. Whether that could one day translate into a reassessment of the Church’s view on homosexuality as an “objective disorder” is anybody’s guess. I’m not holding my breath waiting for it to happen. 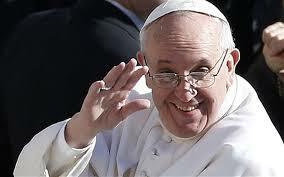 But then, in his very short tenture so far, this pope has surprised me before.